Around Geelong Dental Care also provides all aspects of Preventive dentistry care and family dentistry care. Dentist Geelong can also do fluoride treatment for adults and kids at our Geelong Dental Clinic. Dental Fluoride is a part of our every days diet in children and adults. Increased flouride exposure is needed to protect the teeth from decay. The increased fluoride treatments can also be done by the Geelong dentists. Dental Fluoride can be obtained from many sources. 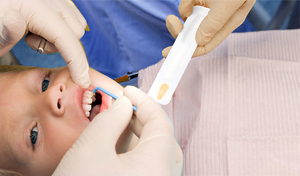 The safest method is also to have an in chair application of dental fluoride by the dentists. The dentist will apply concentrated dental fluoride. The dental fluoride will penetrate into the outer surface of the enamel making the enamel harder. Several applications of the dental fluoride may also be necessary. This can also depend on each individual cases. Safer at home dental fluoride application would be the GC Tooth Mousse. It is made out of calcium and phosphate taken from the cow’s milk. GC Tooth mousse can also be used in children and adults needing the extra protection for their teeth. GC tooth mousse cannot be used in children and adults who have lactose intolerance. If you need any Preventive dentistry treatment like the dental flouride treatment in Geelong. Fluoride treatment can be done at an affordable cost. Please call our dental clinics in Geelong at Norlane to book your dental flouride appointment. Speak to our qualified general dentist who also do cheap dental fluoride treatments in Geelong.